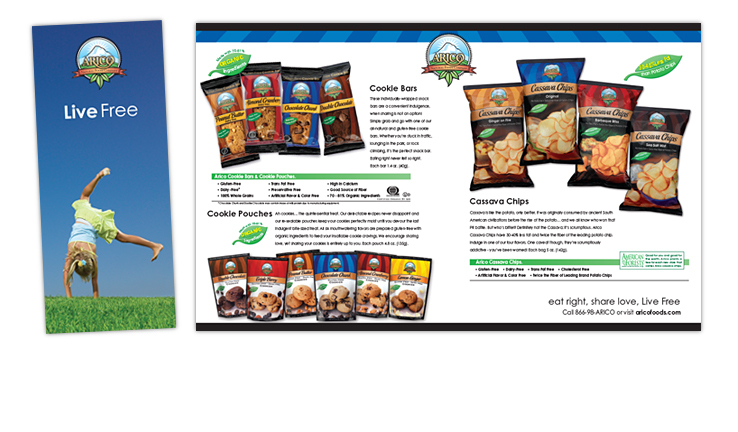 Consumer and distributor communications pieces featuring the family of gluten-free bars, cookies and cassava chips. Arico Natural foods has something for every taste! 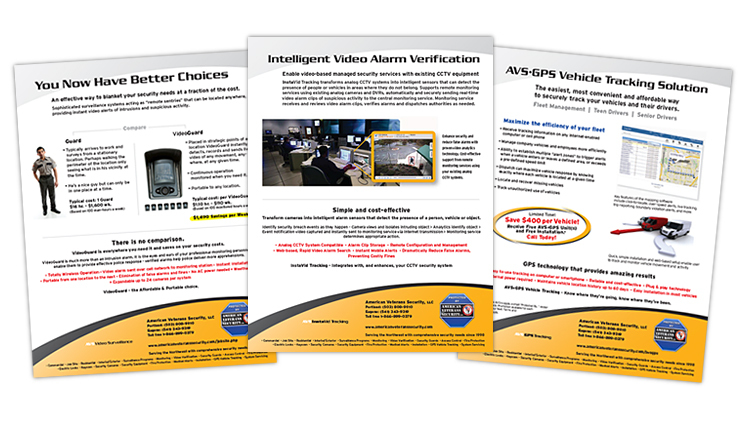 A growing security and low-voltage installation company was greatly in need of unifying its branding and expanding of their marketing materials. A small face lift to their logo and development of a recognizable branded look led to the creation of consumer information sheets, vehicle graphics and a solid brand identity. The Economic and Capital Development department works with businesses to attract and retain economic vitality to the community. Providing resources and awareness of growth opportunities with a goal of sustaining a solid base for the city's economy to grow. 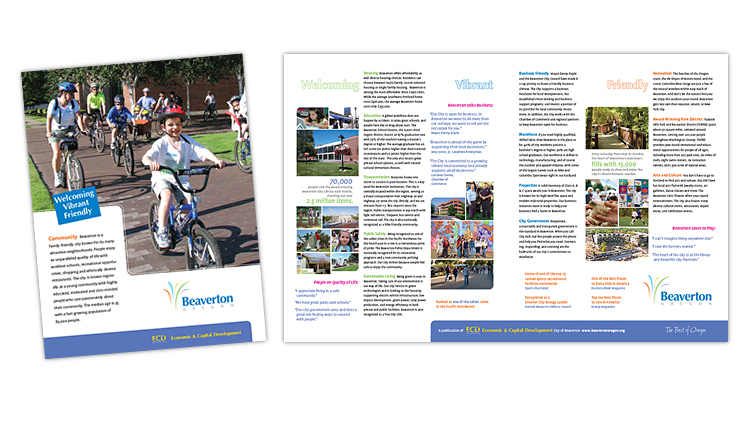 "There's a lot we could tell you" full-page advertisement - Beaverton Visitors Guide. "Economic Developement Strategy" 36 page book. "Business Setup and Expansion Tool Kit" 48 page booklet. "Main Street Program" Old Town development and awareness brochure. Certified arborist company providing residential, commercial and municipal tree health care. From removal to pruning and beyond NW Tree Specialists can handle any job. 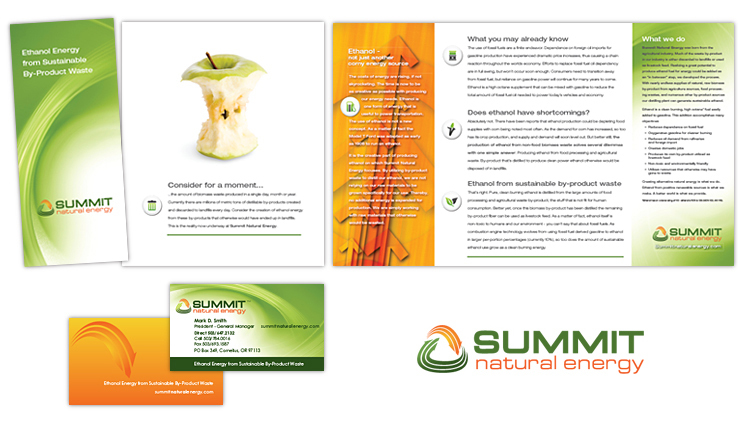 Several pieces including a brochure, postcards and flyers tie the branding together to promote this client's green solutions services. 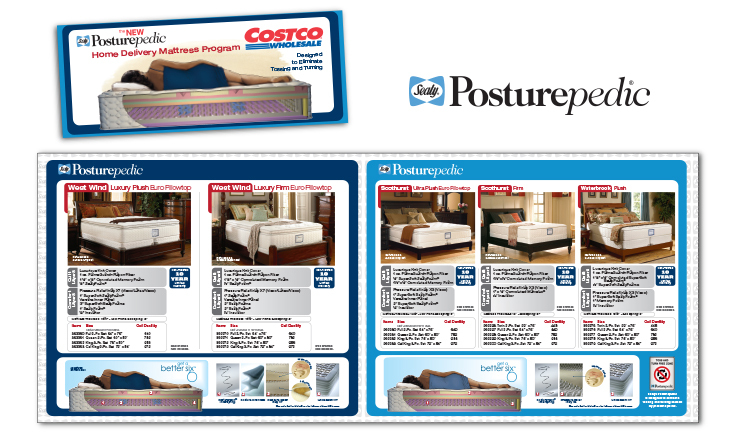 In-store promotional brochure, collateral materials and magazine advertisements for Sealy Posturepedic mattresses marketed through Costco Wholesale International. Created specific branding for this niche retail division of Sealy including Costco Wholesale, Costco Home Stores and Costco.com. 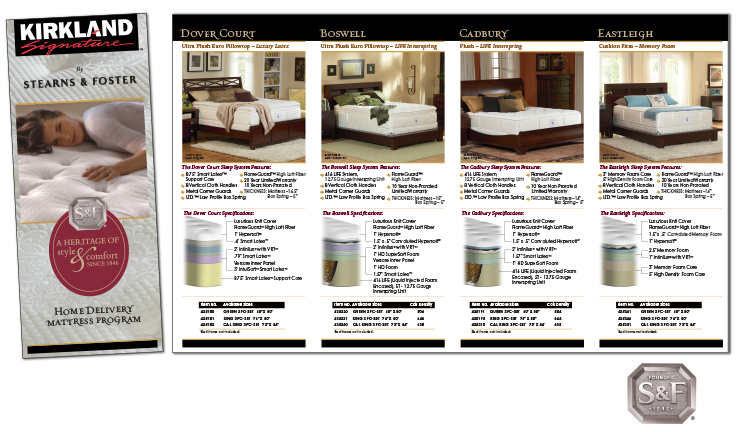 Stearns & Foster, the premier brand of Sealy was private labeled and constructed to the standards for Costco's Kirkland Signature. Costco International markets these co-branded mattresses in selected markets and utilizes these materials to present consumers with the many benefits of these mattresses. This non-profits' identity was created to convey the caring services of the organization. With little budget to put towards branding and public awareness several collateral items were developed. 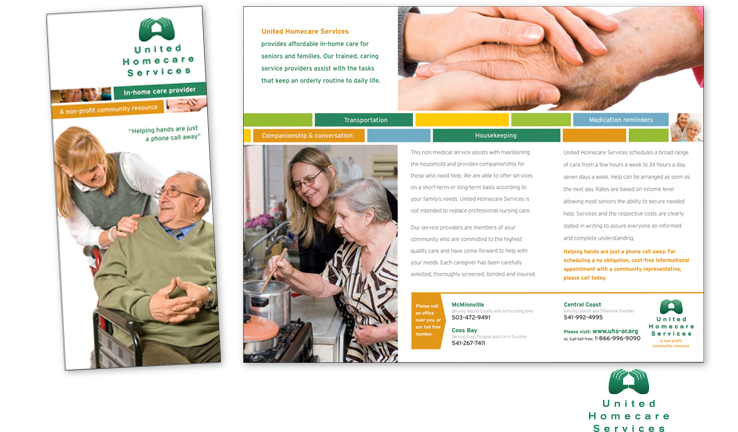 Starting with the design of the "caring hands" logo we developed the main communications brochure, advertisements, mailers, signage, website and stationery system. Born from a fruit and berry processing plant, Summit Natural Energy distills ethanol from agricultural waste that would otherwise simply be wasted. 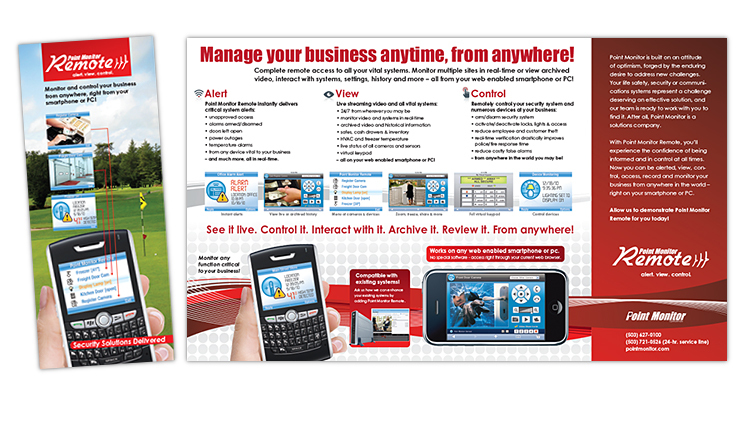 This informational brochure educates on a business to business level about available services and processes. Working with grants from the Oregon Department of Energy, Summit needed an affordable and effective identity to clearly communicate their message. From the waste to energy recycling logo to the clear approach of conveying their message these pieces and related website have helped the awareness of Summit and the valuable resources they provide. Serving commercial clients with their security, surveillance and fire protection needs, Point Monitor turned to Menzel Design to develop a series of communications pieces to distinguish each service category. 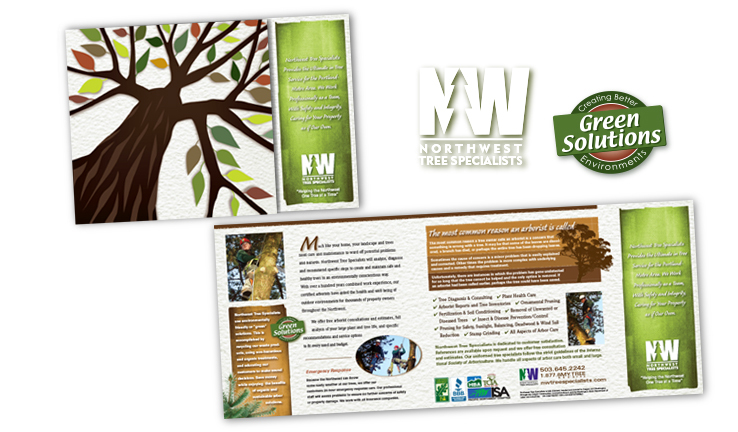 Several brochures and large format graphics created a unified look and private brand. Consciences of the ever changing world of technologies each piece was designed to prolong shelf-life and usability saving our client costs over the long term. 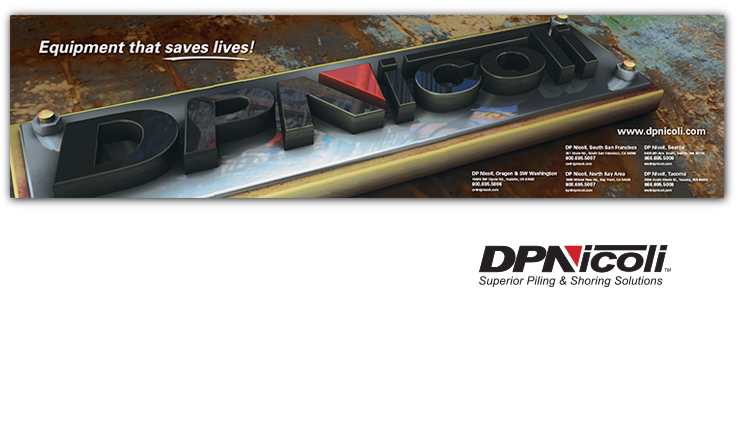 DP Nicoli, the premier shoring and piling specialist of the west coast. This sales and rental company provide the heavy equipment industry with safety equipment and solutions. In addition to the annual catalog of available equipment and specifications, the branding flows to industry trade magazine ads and the dimensional logo art we created for their large format calendar. 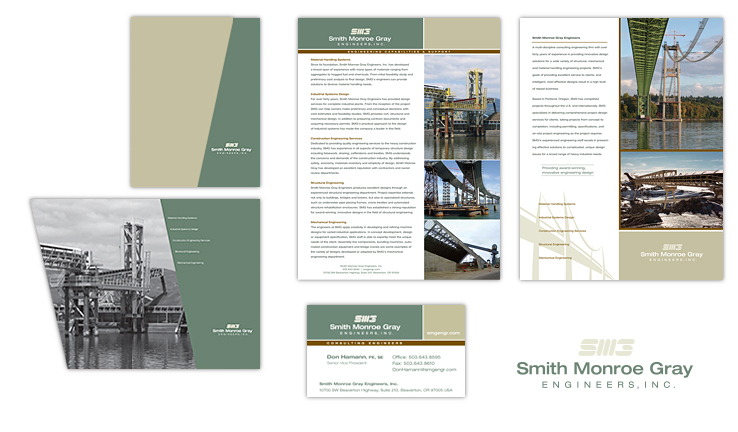 Providing support engineering for bridge and suspension projects Smith Monroe Gray Engineers looked to have a more cohesive and contemporary identity created. 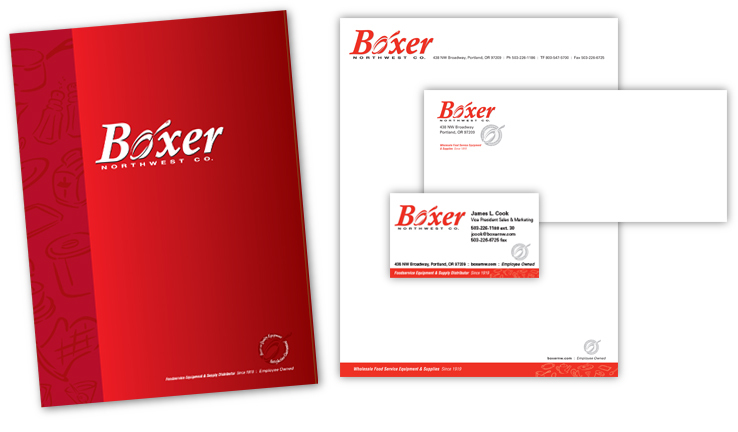 Based around a custom pocketed folder used for presenting proposals and other communications paperwork their new look and feel lent itself well to many other collateral pieces. Portland based restaurant supply and equipment supplier Boxer Northwest had operated without a cohesive identity since 1919. Beginning by unifying the look of their quarterly published catalog Menzel Design created a new masthead with a distinctive logo. From that core sales tool of the company the branding spread to the stationery system, signage and delivery vehicles. Marketing and distribution company catering to the citrus based products of Orange Mate. 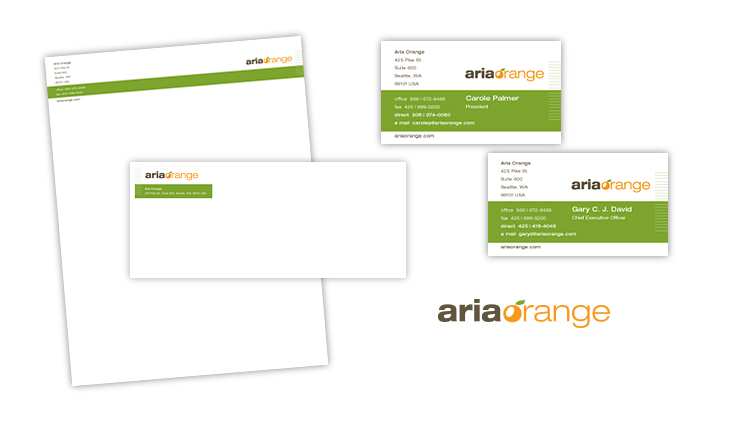 This clean identity package sports a crisp logo with a tie-in to the natural citrus products with its stylized orange. 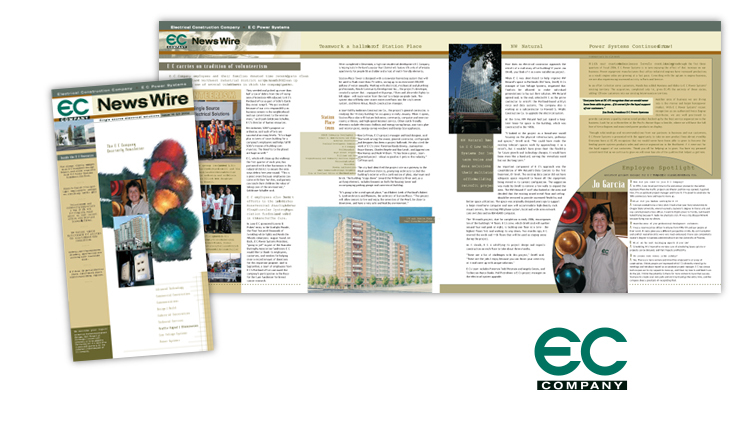 Quarterly newsletter of a multi-division electrical company. Used as an employee communications piece the newsletter also serves as a collateral communications piece to clients and prospective clients alike. This large format newsletter sports EC's updated logo and profiles on employees and projects. The niche market of restaurants and food service companies are boldly honored on this identity piece of Inform Accounting. 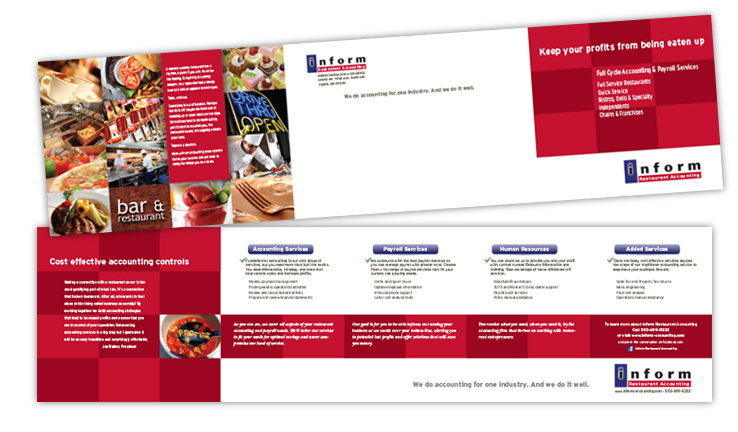 From identifiable photos and checker board styling the brochure communicates short, clear messages of the services available to the fast-paced world of hospitality businesses.